Frontier Fiber Optic Service (referred to as Frontier FiOS) is available to many homes on the Western side of the U.S and offers fiber optic cable from the Central Office direct to your home. The advantage with this setup is that the Internet bandwidth is very consistent since it is not shared by a neighborhood hub. If you have ever had a shared Internet service you will understand the importance of this point, for example at weekends when kids are streaming Netflix movies in your neighborhood and your Internet speed drops significantly. Another advantage is it future-proofs your home from a technology standpoint as the capacity for transferring data is much greater over fiber optics than copper wire. The purpose of this article is to give a background on this service and installation but more importantly, show how additional savings can be made. By utilizing a third party VoIP company for phone service rather than signing up for the triple play package, which adds Frontier's home phone service, great savings can be made on your monthly bill. Also, if you go down this path, some setup recommendations are documented to ensure high quality audio for your phone calls. First of all, a small disclaimer, I personally use Frontier FiOS at home in Washington state and love it. Previously I used Comcast/Xfinity for my Internet service for many years but I got tired of the "pricing dance" that everyone seems to go through with them i.e. special pricing for 12 months and then the bills seem to change monthly. That's when the "dance" begins, calling them or visiting their local office and having to negotiate a better deal. This got old after many years but for me the real issue was speed, or more precisely consistency of service. Over the last 6 months of my service with Comcast my Internet speed would drop significantly for no apparent reason and my VoIP service would suffer in terms of call quality. In addition, streaming movies became problematic due to the shared bandwidth with neighbors. Frontier came into our neighborhood around 2009 after acquiring the Verizon FiOS technology for certain areas in the Northwest, specifically Washington State and Oregon. I was reluctant to switch over at the time mainly because of my contract with Comcast and because its service at that time was working for me. Also, some neighbors switched to Frontier and the billing seemed to be painful for them, most likely due to teething problems with the acquisition. I finally took the plunge this year (2013) and signed up for the Frontier double play package, Internet and TV. The triple play package sounds enticing but as you will see later in this article, using VoIP for phone service can result in significant savings. In terms of the actual installation, a team appeared a couple of days before my installation date to connect the fiber from the street to the side of my house. On the day of my install it took the installer about 2 hours to get everything up and running. This included the time to get my TiVo working with the FiOS TV service. Note: It never ceases to amaze me how much trouble those little CableCards cause for descrambling digital TV channels. 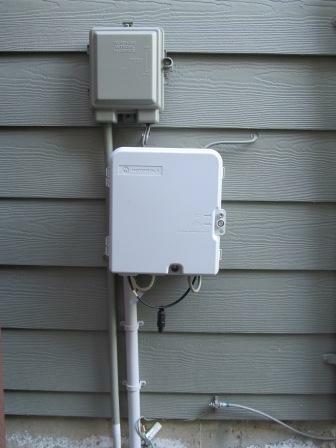 The installer connected the ONT (Optical Network Terminal) to the side of my house (see Figure 1 below) and a battery back-up device (see Figure 2) inside the garage which powers the ONT box. 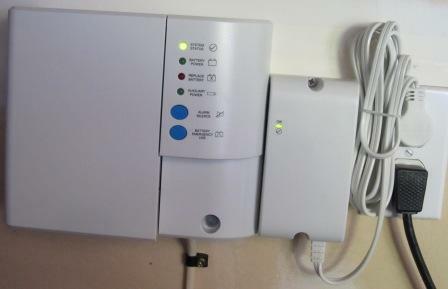 The battery back-up system is powered by a standard mains AC electrical socket. The Comcast/Xfinity service was disconnected from my house (see bottom of Figure 1) and the house co-axial cable was connected to the FiOS ONT box. This is nice because it meant no wiring changes inside the house, thankfully! The battery back-up system must be installed even though I declined the phone service. I found this interesting because the battery is there for legacy reasons - to ensure you have phone service in the case of an emergency and during a power outage. A standard installation requires the battery even if phone service has been declined. Just to re-iterate, the battery back-up is used only for the phone service, it is used to power the ONT and supply power to the phone lines only. It will not supply power to your modem/router, so your Internet will be down when you have a power outage. Note here that you could purchase an Uninterruptible Power Supply (UPS) from places such as Amazon to keep your modem and routers running during power outages. Inside the house Frontier supplied a modem/router to interface with the ONT, in this case the Actiontec MI424WR cable modem which has a built-in wireless router (supporting B, G and N standards for 802.11 WiFi). This connects to a cable point in my house using co-axial cable and has 4 Ethernet ports that can be hard wired in addition to WiFi. 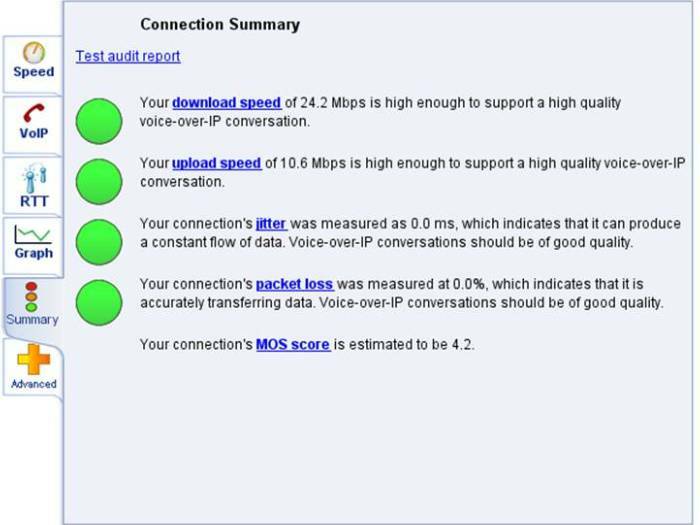 The modem is highlighted below in Figures 3 and 4. As for the quality of the FiOS Internet service, it is very impressive. I have run our comprehensive VoIP and speed test many times over the last few months and each time the results have been outstanding. Our speed test is quite standard compared to other broadband tests on the web but the VoIP test really kick the tires as it tests parameters such as packet loss, jitter and latencies, all of which can play havoc on the quality of Internet based phone calls. Figure 5 below shows the results from a recent test, the Internet speeds are very high, and as advertised (25Mbps downlink and 10Mbps uplink). The VoIP related tests are very impressive with 0ms jitter and 0% packet loss! Also, a quick note on the FiOS TV service. The TV channels are separate from the Internet (and phone service) as they are modulated at a different wavelength down the fiber. This is an important point to note, the TV is NOT stealing bandwidth from your broadband Internet service. Now we know that the actual Internet service is rock solid, let's consider pricing options. Frontier offers individual services along with double and triple play packages. For my family I need TV, Internet and Phone service and as you can see from Table 1 and Table 2 below, going with a double play option and a third party VoIP company for phone service can save me $15 each month (based on pricing at this time of writing). This pricing was taken from the Frontier FiOS website and is fixed for 2 years. As a side note, my bill from Comcast/Infinity for comparable service for TV and Internet (double play) was approximately $135, compared to $115 above. That is a saving of approximately $20 per month. There really isn't a catch. Phonepower is just used as an example above but there are many third party VoIP providers that offer low cost, unlimited minutes for home phone service. The Frontier digital phone service is not advertised as such but it is actually based on VoIP technology too, where the calls are sent over the Internet rather than the Public Switched Telephone Network (PSTN). Furthermore when the feature sets are examined between the Frontier digital phone service and a third party VoIP company, one can see that the third party service is significantly more feature rich. For example, in the case of Phonepower, all of the Frontier phone features are supported but in addition Table 3 highlights some useful features you will get that you cannot get with Frontier phone service. International minutes 60 free International minutes each month. Voicemail to Email Voicemails can be sent as an attachment to your email inbox. Play them from your computer, tablet or smartphone by clicking on the attachment. No need to call your voicemail and remember passcodes. Cloned second line Make 2 different calls out using the same telephone number at the same time. Forward calls Going on vacation? Forward all of your calls to another phone number, such as your cell phone. Free incoming fax Receive incoming fax messages into voicemail and have them emailed to you as an attachment. Softphone Download a softphone for your tablet or smartphone and access your features and make/receive calls as though you were at home. As I stated earlier, there really isn't a catch but there is one point to emphasize that could be considered a negative aspect of using a third party VoIP company for home phone service. Frontier supplies a battery back-up system (see Figure 2 above) and this is used by the Frontier digital phone service to keep your phone running during power outages for up to 8 hours. They did this to be compatible with legacy POTS (Plain Old Telephone System) landline service which supplied power on the twisted pair copper wires at all times. If you MUST have this functionality then perhaps consider sticking with Frontier home phone service. However, keep in mind that most homes tend to have cordless phones in order to expand the number of phone points in your house. Depending on the battery life of those phones you may find that they lose charge before the Frontier battery back-up system. This was not a concern for me as our family has multiple cell phones for emergencies but you should make your own call here. Also keep in mind that a UPS could be purchased to ensure your modem/router and VoIP ATA are powered during a power outage. That way you would have phone service during power outages and still save each month using a third party VoIP service. Of course you would need to spend upwards of $50 for the UPS. If you have reached this far you are likely sold on the price savings and want to know more. This final step discusses some setup options for your network. This is actually a tricky section to cover as there are many ways to setup your internal network. My recommendation is to follow the scenarios outlined in our Home VoIP setup section as you will most likely find the perfect configuration here for your needs. My recommended setup and one I use in my home ensures high quality audio at all times and is highlighted in Figure 6 below. Internet Traffic - This is a generic drawing used elsewhere on our site. The Internet is connected via Fiber and the ONT described above. This then comes into the Frontier FiOS router (and modem) via co-axial cable (i.e. a cable point in your house). 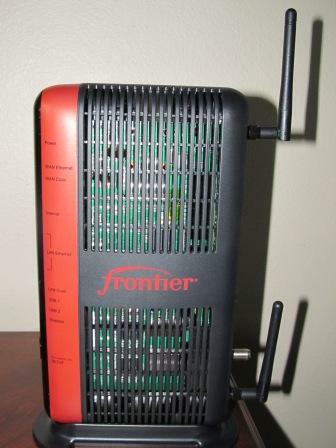 Actiontec MI424WR - The router/modem in the drawing is supplied by Frontier and is made by Actiontec (MI424WR). For my setup I disabled the WiFi part (see Figure 7 below - requires you logging into the router as per your installation guide). Instead, I use a Netgear WiFi router (N150 WNR1000) downstream from there as shown in the square outline box of Figure 6. I do this for two reasons. First of all my Netgear WiFi has a physical button to turn off WiFi - when I feel my kids have had enough Internet time I can turn off the Internet. I usually have a lot of whining to contend with at this point! The second reason is to prioritize traffic, as described next. My Netgear WiFi also supports B, G and N 802.11 standards although one difference is that the hard wired ports are 10/100 speed rather than 10/100/1000 that the Actiontec router supports. This is not an issue for my home networking needs but it is worth pointing out in case you require Gigabit speeds on your home network, assuming the devices on your network can support this speed of course. 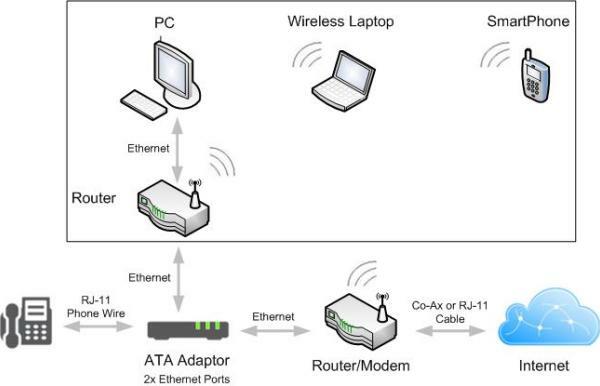 VoIP ATA Adapter - The ATA converts the analog phone into an Internet enabled device. For my VoIP service I use a Grandstream HT502 ATA device which has 2 Ethernet ports, hence the reason I can configure my network in this manner. It also has Quality of Service (QoS) built-in by default. QoS is used to prioritize traffic, specifically to ensure that the voice traffic has priority over the rest of the data in your network. This is performed so that phone call quality is never compromised. By passing everything through the ATA box, it ensures that the calls get top priority. This would not be the case if the WiFi was enabled in the Actiontec MI424WR. Note that some people are concerned to put the ATA so far upstream in their network as it means all of the network traffic has to pass through the ATA, but I have never found this to be an issue. Phone - You may be wondering about the phones. This shows one analog phone connected to the ATA box and in my case it is a DECT cordless phone. In reality there can be many phones, by using a cordless phone system or connecting the ATA to the phone lines throughout your house. Note: Be careful with the last point, read our article on connecting multiple phones with VoIP. Should you wish to have a very basic setup, with the Actiontec wireless enabled, your setup will likely look like Figure 8 below. This is also very convenient if your ATA has only one Ethernet port. 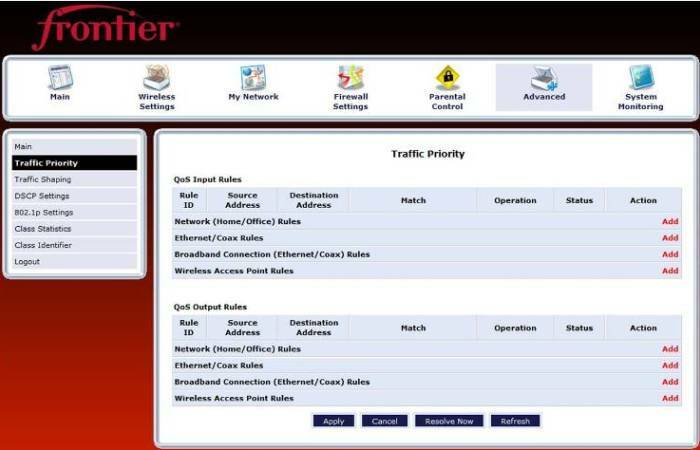 Log into the Frontier FiOS router (e.g. Actiontec MI424WR) - You can do this by opening a browser window and typing in http://192.168.1.1 and using admin as the username and the password is listed on your hardware. Follow your FiOS router installation guide for more details. Configure QoS - To configure the QoS you need to change the settings for Traffic Shaping and Traffic Priority. This is detailed in the following Actiontec guide for QoS. A snapshot of the Traffic QoS section is shown in Figure 9. The Frontier FiOS service is very impressive. The Internet service is reliable and I have experienced no outages at all and it consistently tests at speeds advertised by Frontier. The triple play package is actually competitively priced but by going with a double play package of TV and Internet and choosing a VoIP service for your phone needs, significant savings can be achieved on your monthly bill. My audio quality with VoIP has been excellent, as one would expect since the Internet connection is so fast and stable. If you need help selecting a VoIP service, consult our Residential VoIP section. Find out if Frontier FiOS is an option for your home. Currently available in WA, OR, SC and IN. When I was an ATT customer I could go to a web site known as nomorobo and they would intercept robot calls. I would hear one ring then they were gone. I want to do this with Frontier but no one seems to know how to it. 1) I cannot connect my Ooma VOIP box to work with Frontier's router. It worked easy and great with Comcast before I switched. 2) I cannot download or send gmail, nor download Teleport email. I can browse the web fine and get into the router admin account just fine. Frontier level 1 technical support said they only support the Frontier email server - that has to be garbage! 3) I cannot connect my prior Apple Airport Extreme base station to the Actiontec and get it to work. Not even connection lights on Actiontec WAN port out, get Ethernet connection lights on Ethernet port out to Apple WAN in, but no Internet connection. And potential double NAT latency if it does work that way. Frontier is of no help here with these! -> Response: Sorry to hear you are having so many issues. It sounds like a firewall/port issue on the Router. Sometimes these issues block your "internal" network from the outside Internet world. For #1 we recommend looking at this link, which details the ports that need to be "open" for Ooma to work correctly. Another setting that can have an impact is the SIP ALG in the router. For #2 it maybe related to your email account settings (for incoming/outgoing servers). I have had to change my outgoing in the past on my home PC when my ISP blocked it. For #3, sounds like a similar issue to #1 above. Hope this helps. Thanks for the article, good information. Unfortunately it is not available to me in the Northeast. -> Response: Frontier acquired this technology from Verizon but only for a few States. You may want to take a look at Verizon FiOS to see if it is available to you as most of this article will also apply to Verizon FiOS service.